Memories were jogged as Portreath turned back the clock to mark its industrial heritage.Villagers searched their homes and dusted off hundreds of pictures and artefacts from a bygone age as part of a celebration of the mineral tramways dotted around former mining communities. The memorabilia was displayed at Millennium Hall, Portreath, during a special three-day exhibition that ended on Sunday. While several of the old photographs evoked an era when the harbour was packed with sailing ships, one conjured up memories of a familiar sight during the late mining years. Taken in the 1950s, it captured the Isleman, the last Portreath boat to sail out of the harbour with stocks of tin and copper. At the weekend, its former captain, Gordon Greenslade, now in his mid-90s, attended the exhibition to remember his time on the Bain-owned vessel. 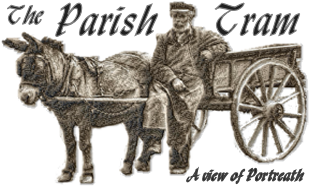 Groups including King Edward Mine and the Trevithick Society lent various items to the parish council, which ran the display and a festival of other events. The exhibition also featured 150-year-old canon balls that once formed part of the village's armoury against invaders at its former gun battery. They were discovered by Robert Hamer after he bought Battery House, the turreted, hill-top property that overlooks Gull Rock out at sea. Doug Coates, one of the festival's organisers, said one collection of old photographs had certainly got tongues wagging. Mr Coates said: "Kate Shaw's father, John Martin, had collected pictures of the characters and people of Portreath - and they created a huge amount of interest. Former and present residents of the villages were fascinated." The appeal for photographic slices of village history first went out 12 months ago, with the final two pictures donated on the opening day of the exhibition. In the run-up to the event, Portreath staged a series of mining demonstrations and workshops, including two run by West Briton photographer Colin Higgs. Mr Coates said he and his fellow organisers were delighted to have seen up to 400 visitors at the three-day exhibition. "The village has given us absolutely tremendous cooperation. We now have World Heritage status which is a boost for tourism. This was a fantastic way of getting the story over."